Richard Strong’s daughter has said it’s unfair that she should now be orphaned. Richard Strong initially ran from police before being caught and saying 'please shoot me'. A MISSOURI MAN who killed his girlfriend and her two-year-old daughter with a butcher knife was put to death Tuesday. Richard Strong, 48, was executed at the state prison in Bonne Terre for the deaths of Eva Washington and her daughter, Zandrea Thomas, more than 14 years ago. He was the fourth man to die by injection in Missouri this year and the 16th since November 2013. Only Texas has executed more inmates over that span. “Jehovah-Jireh, you’re my provider. Your grace is sufficient for me. Forgive me for my sin,” Strong said in his final statement, according to corrections officials. During the execution, he breathed deeply several times and briefly raised his head from the gurney pillow before becoming motionless. He was pronounced dead at 6:58 p.m. local time. 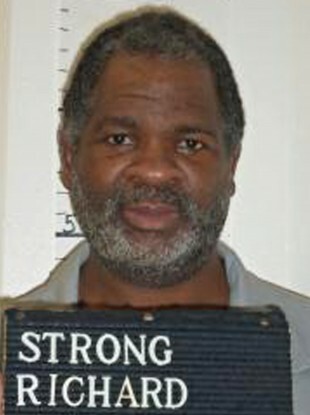 No family members or other witnesses attended the execution on Strong’s behalf. Strong met earlier on Tuesday with his mother, brother, sister-in-law and two daughters, but none of them witnessed his punishment. The bodies of Washington and her daughter were found in October 2000 in Washington’s apartment in the St. Louis suburb of St. Ann. A large butcher knife was found on a bed next to a pool of blood. Strong and Washington’s daughter together, three-month-old Alyshia Strong, was also on the bed, but wasn’t harmed. St. Ann police received a 911 call from Washington’s apartment on 23 October 2000, and heard a scream during it. Officers headed to the apartment, where Strong met them outside. He initially told them Washington was sleeping, then said she had gone to work. Officers saw blood stains on his hand, and Strong tried to run. When they caught him, he admitted to the killings. Inside, police found the bodies and the unharmed three-month-old. Strong’s lawyer, Jennifer Herndon, said both Strong and Washington suffered from mental illness and frequently argued. Alyshia Strong was taken in by Strong’s mother. Despite the killings, she grew close to her father, frequently visiting him in prison. A clemency request to Governor Jay Nixon relied heavily on Alyshia’s words describing the importance of her father in her life. “l know some people probably wonder how I can have a relationship with my father given that he killed my mother, but we are very close,” the girl, now 14, wrote. “I understand that my father needs to face consequences and to pay for what he did, but I do not think it is right for me to lose my father as part of the punishment,” she added. Strong’s fate was sealed when Nixon declined the clemency request and the U.S. Supreme Court refused to intervene. The defence had asked the court to halt the execution because Strong was mentally ill, suffering from severe depression. Email “"He can rot in hell" - Man who killed girlfriend and her two-year-old with a butcher knife is executed ”. Feedback on “"He can rot in hell" - Man who killed girlfriend and her two-year-old with a butcher knife is executed ”.